Well into the rugby union season now and so last weekend saw two matches, plenty of points and some great action. On Saturday came my first visit of the season to the home of Bradford & Bingley - the Bees. Then on Sunday the slightly longer journey to The Sycamores in Bramhope, the club being West Park Leeds Ladies. Again, though I’ve photographed them many times before, it was my first look at the current squad this season. Long time viewers of this blog will know that the Bradford & Bingley club is my local one, the one I first began photographing. They have a number of new players and also a new coaching staff which happens to comprise of Anthony Posa and Hugh Gumbs. They’ve often featured in these pages as coaches of the championship winning Yorkshire Under 20s teams. Things have not begun too well either for the Bees or their opponents on the day, West Leeds. Both needed a win. I’ve got a bit of a soft spot for West Leeds, having photographed them in no less than three finals at Twickenham (one defeat and two wins) and also on a couple of occasions at their home ground. I witnessed a highly entertaining end of season win there against Bridlington last April. So, partly out of loyalty but more importantly as I was needed elsewhere for a charity event in the evening, I opted to remain at the same end for both halves, covering the Bees on the attack in one and West Leeds in the second. As it happened, this proved to be an excellent choice as I saw no fewer than three Bees tries in the first forty and then a couple of West Leeds replies in the second. As you can read in the match report, the Bees emerged as comfortable 34-19 winners, hopefully showing their young side is beginning to gel. There should also be some encouragement for West Leeds as their second half partial recovery reflected great spirit and determination. More pics here. As mentioned, Sunday was West Park Leeds (not West Leeds. Different club. You know that). West Park Leeds Ladies enjoyed an epic 2017-18 season and are already doing well in this campaign. Opponents on the day were Eccles. Several of the Leeds squad are also stars for rugby league side Leeds Rhinos, also playing an end of season game on the day so there were absentees at West Park. This gave an opportunity for some of the younger players in the club to show what they could do. Favourite lineout shot of the weekend. Just a shame the ball was upside down! While Eccles competed well throughout the game they proved to be no match for the home side who amassed a grand amount of points with little or no reply. It was an outstanding performance and good to see some of those younger players making such a positive contribution. A great afternoon - more pictures here. 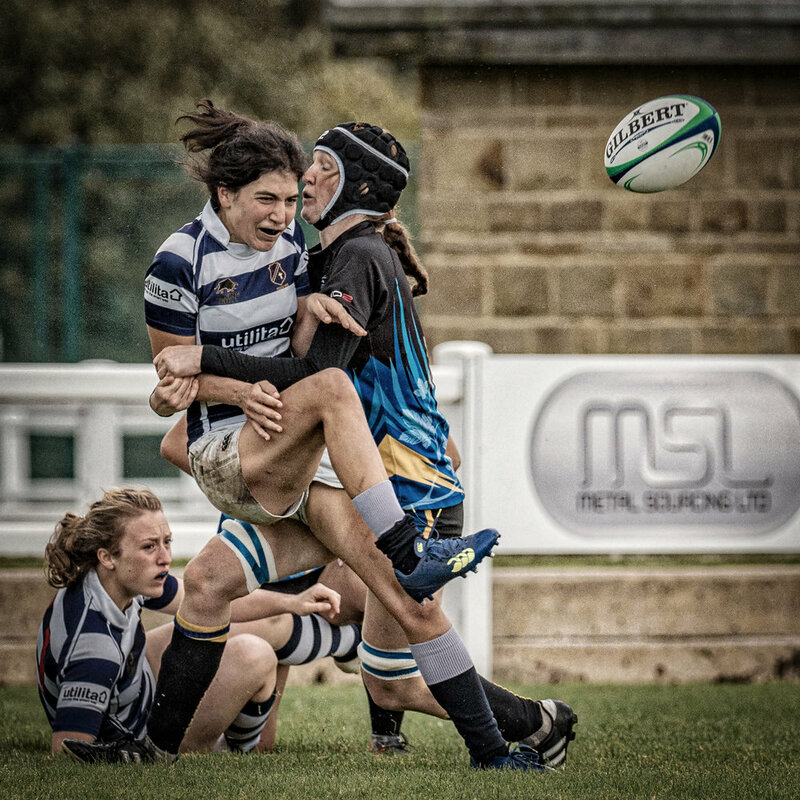 Eyes On The Ball - at first I thought the tackler was airborne in this one but actually her standing leg is hidden. Still like the shot though, the look of concentration on the receiver’s face. The pass was made and another try scored.